Join the discussion on our forums! 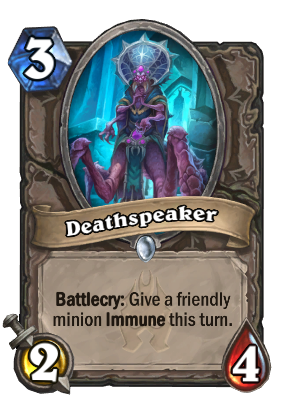 Come discuss Deathspeaker over in our dedicated Deathspeaker discussion topic. Battlecry: Give a friendly minion Immune this turn. It helps to speak really, really loud. I tried using the immunity on a minion that had been targeted by Voodoo Doll. I then attacked Voodoo Doll with that minion. The minion died. So it doesn't make them immune to the Voodoo Doll destroy mechanic. one of the best arena cards in this expansion. This and Keening Banshee is crazy good in Arena. windfury suddenly becomes great . . .
WOW! Makes almost every deck that plays early minions and fights for board control better! Especially in a mirror or similar play style match up. One of the more powerful cards we've seen so far IMO. Looks like nerubians decided to do some stuff this expansion. Immune means your minion can't die, so you can abuse it multiple times in a turn. It is different from Divine Shield which can only protect it once. This card requires some set up, but has a lot of value. Yeah pull that combo and all you get is a very expensive board clear (assuming you clear your whole opponents board). If you have a 8/4 megawindfury that will die on your oppponent next turn (lets be realistic here) is much easier to just hit face for 32 damage. Only some warriors or druids can take that hit. But if you look at Kripp playing this guy in Quest Mage deck, he often has a problem that it dies while trying to go through taunt even though with stat flip and Molten Reflection he should theoretically do 64 damage, if there are taunt minions in the way it becomes a problem, so that was the idea. "What? I can't hear your comments over the sound of my Invinsible Sandworm!" Except one is wild and the other is one of the worst cards in the game. At least this one gets a decent body. I only just realized that Giant Sand Worm might even be a decent card now. It is a massive minion that can come back with bowman even if it doesn't manage to impact much the first time you play it. Unlikely maybe? but it's a thought.